Twiggy and Opal: Black & Orange :: For Lack Of A Better Name! Black & Orange :: For Lack Of A Better Name! Got it done! Front, back, top to bottom! I am pretty excited about this design and the possibilities it offers. From colors to quilting, it can change the entire feel instantly! I seem to be moving in the direction of more and more paper piecing, and my second paper pieced design has me longing for even more! The plan is to make a pattern for this design. I know, I say it all the time! I'm in the beginning stages of figuring out the details. I want to make a larger version in different colors, change the block assembly as well as using a larger size block. Testing my pattern one more time! I'll keep you posted...just in case anyone would like to test for me?! The blocks inspired me to play with the quilting. I had the start of an idea, but as with many of my quilts I tend to work on a section and then build from there. Much like improv, it builds as I go. Black quilts are always tough to photograph. Either they are too black (like this one), or they are totally washed out. Not to mention the camera picks up every single piece of lint even though I rolled it into submission with my lint roller. It was an obvious choice to highlight the 'X' in the middle with 1/4" straight line quilting. There are areas I mimicked the triangles, added diamonds and tossed in more lines. I tried using my hera marker to lay down the lines, but as you can imagine it was difficult to see. Instead I used this handy little chalk roller. I think it might be a Clover Chaco-Liner Wheel, but I can't be sure. It was another tool I yoinked from my daughter! I was able to get good lines and see where I needed to go. A word of advice, don't mark too many sections at once. The chalk will brush off and you will end up having to remark your lines. While I mostly used black thread, I also used orange for the 'X' and bigger orange sections. The triangles were left untouched. For the pattern (once I write it), I'm debating having different size blocks for three quilts. Small for a wall hanging, medium for a baby quilt and large for a lap quilt. With little experience with patterns, I don't know if that is a 'thing' or the 'thing' to do. If anyone has advice about this I would love to hear it! My next venture with this block will be using a different color palette. I love the orange/black combination, but feel it's worth trying something different. I've had a stack of my daughters hand dyed fabric she gifted to me years ago...they might finally have a future! Next to actually writing patterns, the next hardest part for me is naming a quilt! For now I'm lovingly calling it Orange & Black! Pretty original right?! Love it! Gorgeous!!! Can imagine how difficult it is to quilt black fabric! Darker fabric is always harder to mark and quilt! I love this design! It's very effective in the orange and black but I am excited to see what else you can do with it. I played around with many different layouts, there are a lot of possibilities! I think for the pattern I’ll stick with this design, but add a few variations for reference! Восхитительно! Отличный дизайн. Очень нравится. Lovely quilt! It is striking in the orange and black. I think the orange and black was a good choice. It really lets the design standout! I’ll have to search ‘ryijy’ and see exactly what you are referring to! But they sound gorgeous. I hope to start the next quilt in different colors very soon! I can even imagine it in a rainbow of color! I agree on the different sizes. Basically everything will be the same, just different block sizes. Options are always good! Jayne, This is such a beautiful and amazing design! I LOVE it! You are truly an artist! I'm super inspired. Thanks for sharing. Wow. Just wow. It’s amazing how well the chalk roller worked on the black fabric! I don’t think I could have done the quilting without it! I know Joann’s carries several different kinds, as well as fabric shops too! Great job ! It's a striking quilt Jayne. I think size option is good idea for your pattern. And I'd be happy to test for you again. Jayne - This is stunning. The color contrast is outstanding. The design is very original and beautiful. I hope you make it into a pattern. Can't offer any advice on your question. I haven't done any major designing. Keep going - what a lovely job you've done. I love this color combination! I will make it into a pattern with a new color combination for the fun of it! thank you for the support and for giving me the confidence needed to continue! love this and it was beautiful in person. I like the name Kenyan copper Orange & Awesome, because I see the KOA logo in my mind! Great finish Jayne. It is beautiful. The black and orange do play well together. Would love to see it in another color way. It's beautiful! I love it!! To me it has a bit of Southwest flare to it. Naming them is very hard indeed! You did a wonderful job with the whole thing from color,design to quilting! Wonderful finish, Jayne! So dynamic and bold. I love the quilting, and all the different sizes and shades of triangles. Amazing!! This is a great piece, with great quilting. I'd love it even if it wasn't orange LOL I think three sizes is a good idea for the pattern. I'd test for you if you need someone. Love it Jayne! The colour contrast is fantastic and the design is amazing. Cool design, lovely color combo and your quilting added great texture! Congrats on beautiful finish! Beautiful design Jayne! And your quilting really sets off the lovely piecing. Great job! what a beauty and so much creativity!! Gorgeous pattern and superb quilting! I'd love to have the pattern in those three sizes. If you could perhaps even add advice for the quilting? I am going to keep practicing! Your quilting looks fabulous! Stunning! The composition, color and quilting! I can see why you're excited with it. Beautiful. Oh Wow!! This is beautiful, the orange and black work so well together, this would make a stunning wall hanging, quilting is just perfect, well done you! This is a gorgeous quilt, Jayne. I am looking forward to the pattern. I recommend you enter this one into the Blogger's Quilt Festival. This is a very striking quilt. Great job! Very pretty! I'm jealous of your quilting. Must have taken forever. If you're going to do it again, it would look great in red and white! Such a strikingly beautiful quilt! 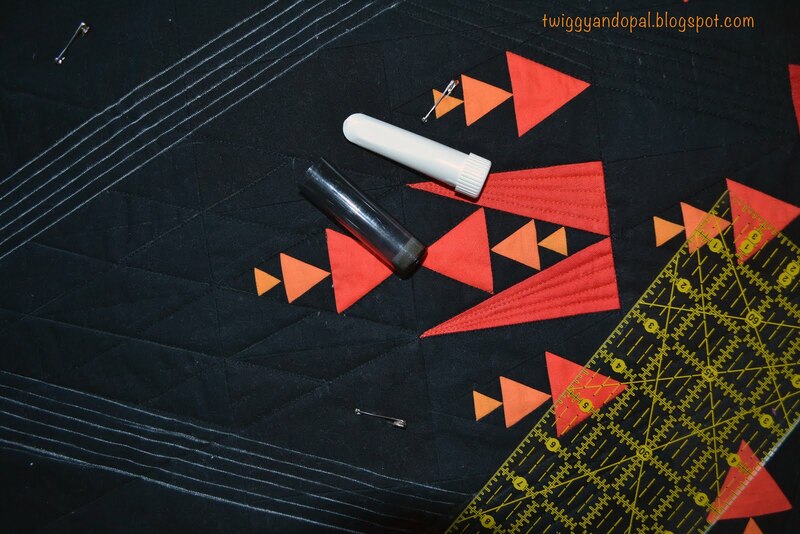 I love the contrast between the oranges and the black, but can't wait to see what other colour combinations you may come up with in your pattern testing phases. As usual, your quilting has done an amazing job of enhancing this graphic design. It's beautiful, Jayne! The design is very striking and the quilting is perfect for it :) Good luck with getting the pattern written. People do seem to like patterns with size options. Sometimes I do size options for mine, but other times I don't bother. It kind of depends on the design, for me. So gorgeous Jayne. I would never have chosen black and orange yet I love it - that's what's so great about reading people's blogs because you see things you would never have tried before. I LOVE IT!!! I'm Native American and it looks so much like a native design. The colors are perfect and the quilting brings it to life. I will be watching for the pattern as I want to make one in this color combo and one with a bright yellow background featuring an aqua or peach for the design. As for the three sizes I for one would like that option. If you need a tester for a wall hanging size I would be happy to help. Beautifully done! Black does just a good job of making colors glow. Hope the pattern writing is going smoothly. Gorgeous! Love how the colors pop on the black. Excited to see the pattern, love paper piecing. Wow that has beautiful impact. I don't mind doing little bits of paper piecing but I don't care for the scraps of odd shapes left over and often bias in weird places. I can't throw anything away so hate to have those and not do something with them. Any suggestions? I don’t like to throw away or waste fabric either. When I started making paper pieced patterns, I decided I was going to give sizes for each section. That way there is less waste and thinking involved, ample wiggle room and precutting the section pieces for me makes the process so much easier and quicker. I found it frustration figuring out the size of a section, and then in the end to find out it’s a bit too small! Is The Suspense Killing You? !